A moist and delicious afternoon tea cake, this banana cake is a easy to make. Popular with kids, it is also a great dessert for special occasions. 1. Sift the flour into a large bowl. 3. Break the eggs and add the vanilla essence, butter, milk, walnuts, almonds, raisins and mashed bananas. 4. Stir well until combined. 5. Transfer this to a greased loaf pan lined with parchment paper. 6. Place the pan into a preheated oven at 180C/360F. 7. Bake for 25 to 35 minutes or until a skewer inserted into the centre comes out clean. 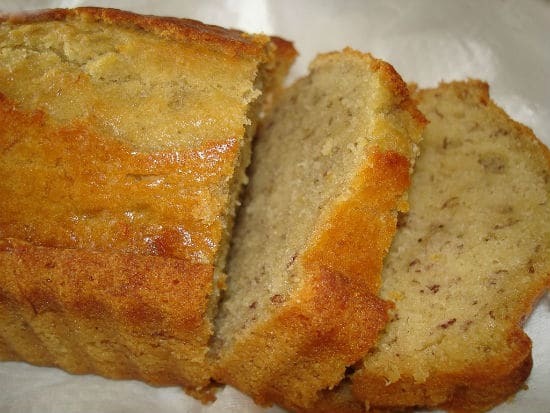 Feel free to comment or share your thoughts on this Banana Cake Recipe from Awesome Cuisine.